Tag Archive | "feral pig"
California draws visitors from all over the world. Some come for the wine. Others come for the sun. Many come to see what has been described by such literary luminaries as Jack London and John Steinbeck. It was Steinbeck Country (the Duckworth family, depicted under a pseudonym in The Grapes of Wrath, has a family graveyard and ranch just down the way) that a production team from Finland’s JIM TV had come to film an episode of AMERICAN FOOD BATTLE. The main ingredient was to be the well-known feral hog of California. 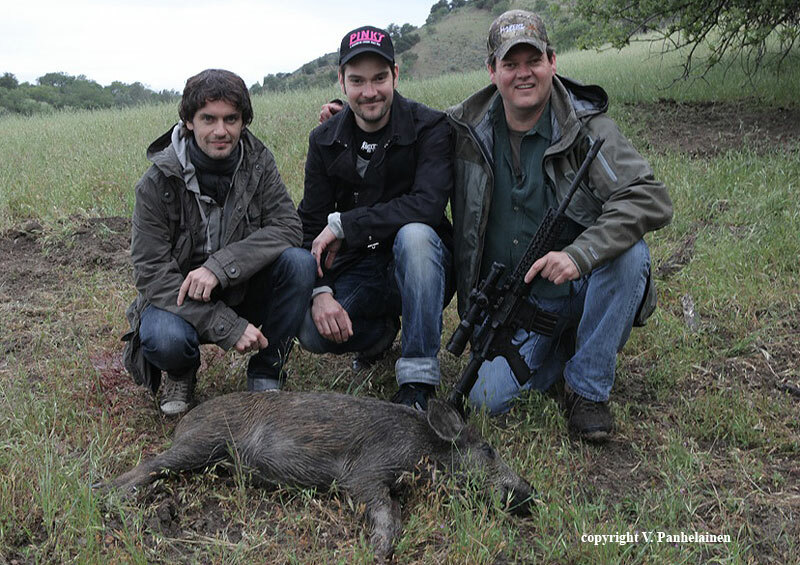 Within an hour of meeting the cast and crew at the gate to Native Hunt Ranch, we were onto pigs. They were huddled under the overhang of a large, old oak when we came over the knoll in a four-wheeler. I knew they had to be there what with how a cold snap and rain had rolled in the night before. I breathed a sigh of relief as they weren’t where they normally were on Native Hunt Ranch. There was a lot riding on getting a pig today. I had a new AR-15 that UT Arms had specially made for our sister online publication, GCT Magazine, that need to get practical use, and I was guest-hosting a new cooking show for Finland’s JIM TV satellite channel. AMERICAN FOOD BATTLE had come out all the way from Helsinki to see how we hunt and eat in Monterey. Frankly, I was actually delighted with how swiftly things were happening. Though I have spent a bit of time at rocker and friend, Michael Riddle’s Native Hunt Ranch, and enjoyed watching the multitude of animals on the property, there’s nothing guaranteed in nature. Normally, the pigs like to hang out in a canyon that bisects the ranch, a thoroughfare between the Fort Hunter Liggett Military Base on one side, and another ranch on the other. It wasn’t very comfortable navigating across the green hills of Monterey County in the early morning drizzle, and so I knew the pigs had the same problems. Like the log house lodge that serves as respite from the cold and rain to guests, the shelter under California oaks provides the same. When we encountered the feral hogs, I pointed to a glade of oaks, and hushed, “Pigs!” Henry Dhuy, the cameraman, grabbed his equipment from the back of vehicle. I grabbed my AR-15 from its case, and did my best to chamber a round quietly. The pigs were tired from what must have been a horribly unsettling night of rain, thunder and lightning, and were sluggish in making a break from comfort: all of them were huddled next and on top of each other to keep warm from the wet and cold. By the time I edged over the hill, and checked back to make sure the Finnish cameraman was ready, two had come to their feet. One of them would be mine. Laying the forestock of the AR-15 on a collapsible bipod, I quickly lined up the crosshairs on the smaller of the two pigs. This was a cooking show and I was doing my best to get the best-tasting porker in the bunch, 50 yards away. With the RR-CQLR’s crosshair bead centered on a point made by an imaginary crossing of two diagonal lines, from base of ear to eye on the other side, I touched off a round. The 65-grain hollow-point hit the 55-pound sow, and she jumped straight up in the air, just like countless cottontails I’ve shot in the head with a .22LR. After a few photos to record the event, we transported her over to the skinning shed on the other side of the ranch, and began the quick process of gutting and skinning the perfect-sized porker. Innards are oft lost in this modern day. of agriculture thrived and survived on these, so much so that it was all they needed….and they didn’t get tooth cavities which became more prevalent as we moved from hunter/gatherers to farmers, from meat to grains. 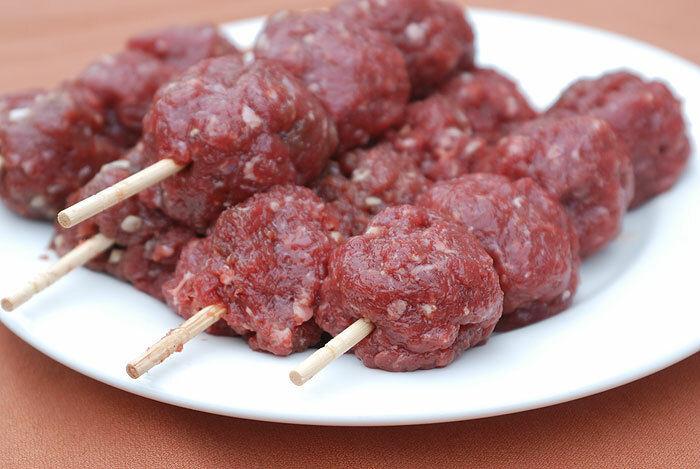 “Do you want to work with these?” I asked our culinary masters from Finland. Chef Henri Alén, and Sommelier Nicolaus Thieulon, are co-owners of the successful Muru Ravintola, a French and Italian fusion restaurant in Helsinki. Veterans of a variety of cooking and travel shows in Finland, they’re well-versed in not only cuisine and but also pairing good food with wines. They took the liver, kidneys, heart and ham. I took the ham and the backstrap. The meat cut like butter it was so tender. 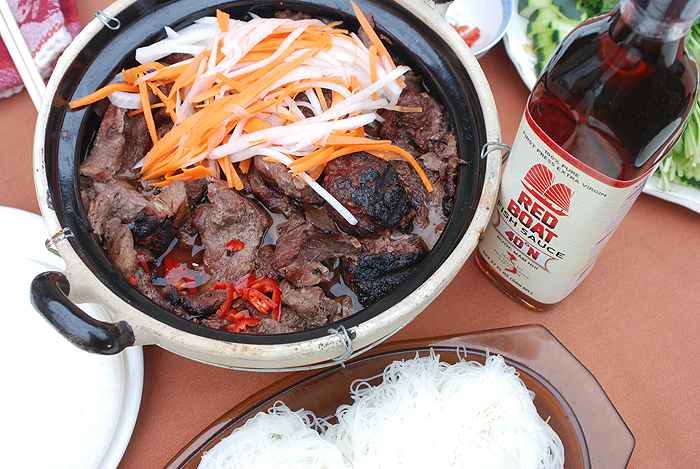 Heading back to the lodge’s open bar and roofed kitchen, we began work on meat preparation. 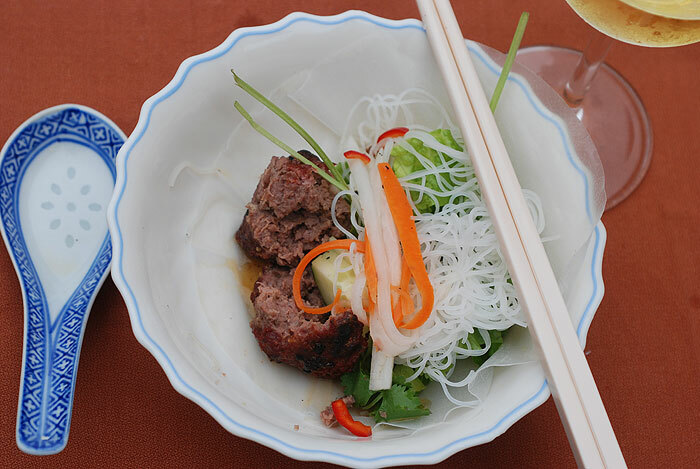 I was going to offer my old bear, deer and wild boar standby Vietnamese-style marinated and grilled meat on rice noodle and salad, for the competition. The Finnish team opted for wild boar bourguignon. Knowing the Fins have a long history with firearms, not the least of which is noted in history and present day by Sako, a manufacturer of fine rifles and ammunition, I invited the hosts to do a bit of target shooting off the back deck at a metal target stand 50 yards away. I’d been looking forward to getting more practice with a GLOCK 17 and my new favorite 1911, the S&W 1911TA. Emptying the 1911’s magazine into the target, the show’s producer, asked if he could have Henry Dhuy, a Los Angeles-transplanted cameraman, collect some video of me teaching an impromptu basic pistol shooting class, albeit at very long ranges. Alén and Thieulon were ringers. Henri attributed his great shooting with the Glock 17 to his days as a recruit in the Finnish Navy. When we were done it was time for me to get to work on the grilling of the meat component of my dish so that both our dished would be ready at the same time. I’d say more, but that would be cheating the viewers of finding out who won the competition. According to the producer, this season is presently being being edited and will be broadcast on JIM TV spring 2013. So what was it like to be on Finnish TV? Very edifying! Here in the States, aside from language-dedicated audiences, such as those of Canal 14, we shoot in English for an English speaking audience. In Finland, a nation that was one occupied by Russia and Sweden, the production team shot English with me, and then in Finnish and Swedish between Alén and Thieulon. It gave me a lot to think, and you’ll begin to see some add-ons at Cork’s Outdoors, and our other multi-media publication, GCT Magazine, for our international audience. When hunters began using AR-10 and AR-15 rifles many words were fired back and forth between two camps. One camp considered the introduction of the “Black Rifle” a pall on the activity. 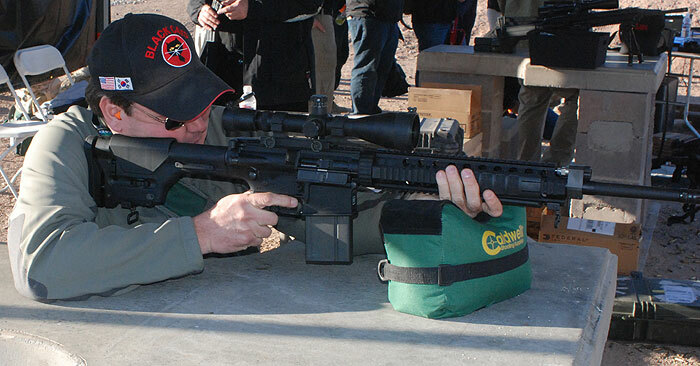 The other camp lauded the attributes of the AR as a fine addition to the hunting community, either with a full 30-round magazine, for varmint control, or a five or 10-round for big and small-game. Many of those in either group can often be determined by their generation. Many more options, many more calibers. Those over thirty years old are often in the first group. They were also likely to have had their first experience in hunting with a more traditional lever action, pump, or bolt-action rifle. AR enthusiasts, on the other hand, were often introduced to the AR-style of rifle through M16/M4 they were issued in the military, or attracted to the firearm through watching action-adventure movies. Perhaps they purchased a civilian version of weapon they carried during their youth and want to recapture that part of their military life, and used it to plink and enjoy the relaxing activity of target shooting. Unlike the other shooter who probably graduated from a learning to shoot with bolt or pump action wood-stocked and started hunting small-game, then developed into a big-game hunter, the shooter first introduced to shooting through the military, had never hunted, but suddenly wanted to try it out, especially if they’re part of the “slow-food” movement that has sprung up in response to Michael Pollan’s bestseller, The Omnivore’s Dilemma. They went to the firearm in which they were well-versed: the AR platform. Personally, I have no problem with the use of using AR type rifles, though I also prefer to hunt with a more traditional bolt-action or lever-action rifle. I’m not partial to shooting fast with a rifle having the type of pistol grip on AR and AK-type rifle. 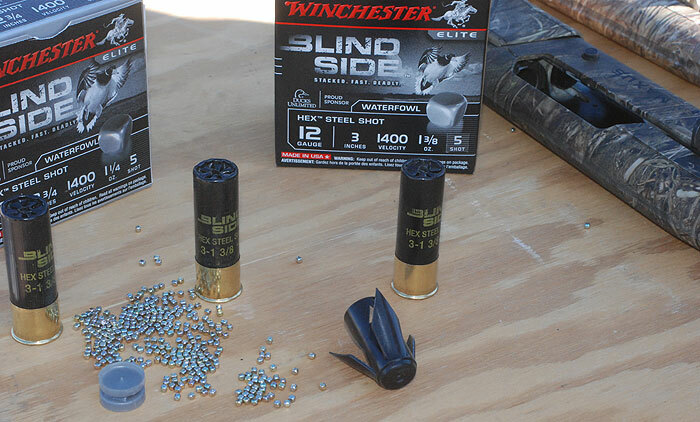 It’s a smoother transition to shoulder a rifle or shotgun from a two-handed, ready, carry with a traditional type of grip, like the straight, English-style grip on a Winchester 1894, or a curved grip on a Model 70. 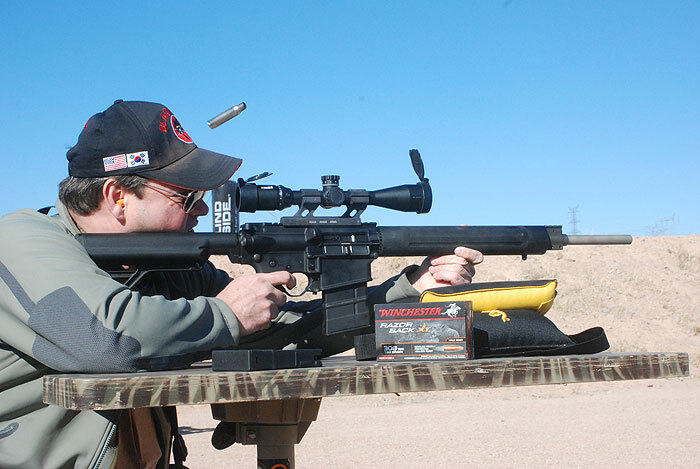 An AR15 on the other hand makes, because of its overall design, for a precision rifle for shooting from a rigid position, a stand or a blind, with a platform a set of shooting sticks. The reason is that the pistol grip found on Black Rifles positions the trigger hand in a very relaxed position when the rifle is shouldered and enables the shooter to put all tension into the trigger finger. In the world of traditional hunting stocks, this positioning of the grip hand is accomplished by either adding a pistol grip to a slightly modified stock, or forming a stock in the manner done for a thumbhole stock. One of the most accurate rifles I ever owned, the Savage 93R17 BTVS, was a true tack driver, for not only the stainless steel bull-barrel and AccuTrigger, but also the thumbhole laminated stock. With regard to whether using an AR-15 or AK-47 is sporting or not, is pretty mute. Most states already require a round limit on magazines. Also, most hunting situations offer only a few viable shooting opportunities before the animals make it to safety: while shooting to remove the enemy’s will fight is the norm in war, incapacitation; shooting for a “clean kill” is the objective in hunting. Regarding overtake, there are laws and whether the shooter is a law-abiding hunter, or poaching game hog, is irrespective to what firearm the person in question is carrying. Finally, do you think the animal being shot really cares how sporting it was that you just killed it with a 5-shot bolt action rifle, or AR15 with a hunting regulation-required 5 or 10-shot magazine? Whether you hunt with a traditional wood or composite stock, or an AR15 rifle that was originally designed to arm soldiers, is your prerogative. How you carry yourself in the field is was matters, and just as importantly how much time you spent on the field getting to really know the ins and outs of your firearm of choice, and its ammunition, to make sure that your shot is fast and efficient, both for the least amount of duress to the animal targeted, and the increased likelihood its flesh will be delicious at the dinner table.